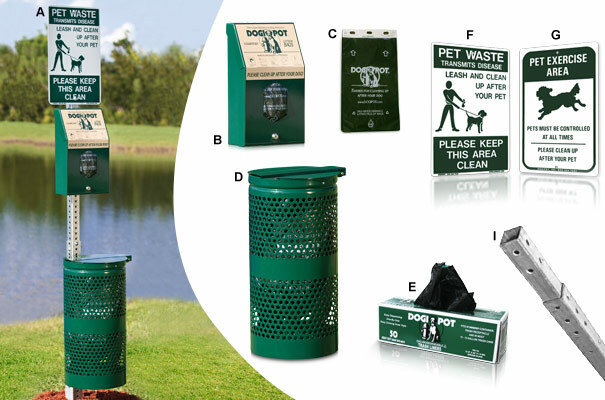 Header Pak DOGIPOT® Pet Waste Disposal Station designed to cater to individuals who favor dispensers that hold hanging bags rather than rolled bags. The Header Pak dispenser holds up to 400 hanging bags. The Header Pak litter pick up bags contain 100 bags per card and fit all major brands of hanging bag dispensers. Heavy-Duty commercial durability makes the DOGIPOT® Pet Waste Disposal Station perfect for high-traffic dog parks. Set it up in a highly visible spot and help eliminate the harmful environmental effects dog waste has when not picked up. The Pet Waste Disposal Station is a proven solution for keeping dog-friendly areas free from dog pollution. Environmentally-friendly DOGIPOT® litter bags release less CO2 than a leaf and are designed to meet US Standard Guide ASTM D6954-04 for OXO. The DOGIPOT® Pet Waste Station components and other products and accessories can also be purchased separately to create your own pet waste disposal system. C - 4 Pack of 100 count OXO 8"W x 13"H opaque green Header Pak perforated tear away litter pick up bags. E - One box of 50 count OXO 10-15 gallon opaque black 1.5 mil thick trash liner bags with draw tape. F or G - Your choice of an on-leash or off-leash 12"W x 18"H reflective aluminum pet sign. 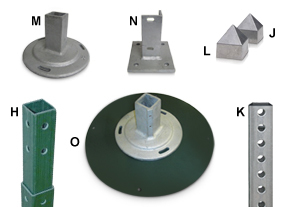 I - A 2" x 2" x 4' to 8' tall telescopic galvanized steel mounting post with two carriage bolts ( 2-1/2" x 5/16" Dia. ), washers and locknuts.